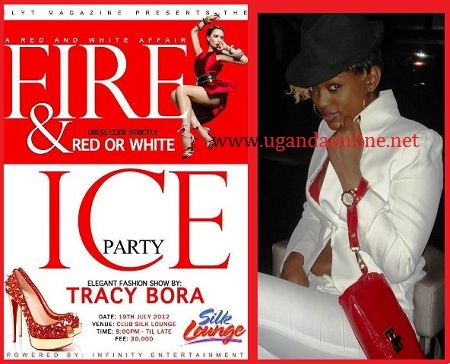 City socialite Tracy Bora has joined the fashion world and in two weeks time, she will be holding a Red and White Fashion party at Silk Lounge. The fashion show dubbed 'Fire and Ice Party' is by the Elyt Magazine team that brought you the Zari White Party last year. The dress code will strictly be red and white or you are bounced. Partiers will be required to part with 30k to access the venue on the 19-July-2012. Tracy Bora is now searching for models though she warns that they must be real hot and not so common. We wonder where this leaves the hot and common models like Doreen Kabareebe. The Fab Clan(Judith Heard+Sue Ochola) brought the White Party to Kampala and later Zari introduced the Zari White Party that saw most stores in Kampala having a quick rush for white outfits, Now Tracy Bora has ventured in this area too. In our gallery, one commented that Tracy Bora makes news because of her curves, she is now moving out of that camp to a more challenging camp.